NEW!!! 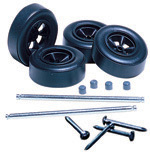 Racing Wheels now includes four replacement wheels, two one-piece axles, four nail-type axles and five hubcaps. Check with your group leader for local race rules (wheels and axles that do not meet specifications may be disqualified).